We believe the following question is a simple one, but not necessarily straight forward to answer. 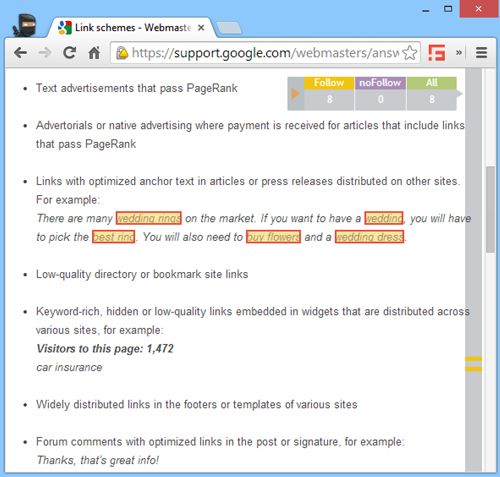 How do you identify manipulative back links which are in breach of the Google Webmaster Quality Guidelines for link schemes? In order to tackle the problems caused by manipulative links, such as Google Penguin algorithm issues or manual actions, it is essential to understand the difference between natural and unnatural links. What is a unnatural link? Google often refers to manipulative links as being part of link schemes, implying large scale activity. However any link can be deemed manipulative, and even just one manipulative link is in breach of the Google Webmaster’s Guidelines and can lead to issues. Self education < Hopefully that’s where we can help! We know how hard it can be for people to identify manipulative links without any previous knowledge of what manipulative links actually are. That’s why together with a group of friends we have produced The definitive guide to manipulative links, with the vision to help the world tackle manipulative links! You can navigate through the guide via the next and previous links at the bottom of every page. Alternatively you can jump straight to a topic you are interested in by browsing the navigation sidebar on the right of every page. In conjunction with this guide, we have also launched our free Chrome extension, SpamFlag. It can often be very difficult to find the actual location of a link on a webpage. When you are reviewing hundreds, if not thousands, of links per day this process can become tiresome and hugely time consuming. Our manipulative link identification tool SpamFlag helps with this, quickly and easily finding the location of any link, to any target domain, on any page. You can sign up to be a SpamFlag beta tester here.